Discus are a breed of fish from the cichlid genus. They are native to the Amazon River basin and are widely known for their bright, flashy colors and easy to recognize shape. When properly taken care of, discus fish can live between ten and eighteen years. It is important to keep the temperature inside of the aquarium above twenty seven degrees Celsius, with soft water, as the fish may become weak and frail in acidic water. This means that checking the pH level daily is crucial to the survival of these fish. While many owners enjoy decorating aquariums, discus are one of the few type of fish that fare best in an open environment, with few additions set in the aquarium. Discus fish are an omnivorous breed, though they require higher amounts of protein than other breeds in order to effectively promote their health. Different breeders may swear by different diets, including single source foods such as bloodworms or brine shrimp. In order to make sure that the fish are getting the appropriate amounts of nutrition, it is recommended for owners to feed them a combination of dry and frozen foods. Discus fish need to be kept in a spacious aquarium in order to encourage them to breed. Keep the water temperature and acidity at optimal levels and keep your eyes open for activity, because once laid, eggs will typically hatch in two days. Once the fry are born, keep them in the same tank as their parents. After three weeks, feed them brine shrimp, and after six weeks, it is safe to separate them from their parents. 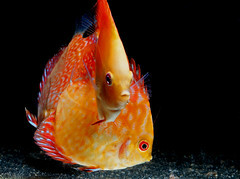 As with any breed of fish, it is important to keep the aquarium safe and clean. Discus are susceptible to diseases such as flagellates, tapeworms, general skin and gill parasites, and eye problems such as cloudiness and popeye (exophthalmial). Additionally, they may be susceptible to fin rot and abnormal swimming if the appropriate temperature and acidity conditions in the water are not met and maintained regularly.